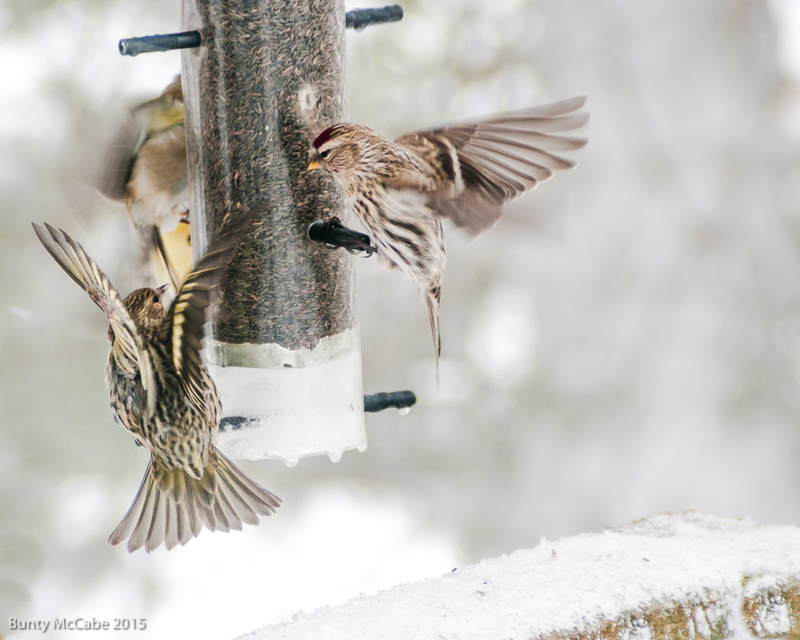 Birds in Blizzard « "I do wander everywhere"
Pine Siskins, left and Redpoll, right, fight for feeding rights. On Monday last we had a blizzard on Prince Edward Island with over 80cm (32 inches) of snow in Charlottetown, 20 km (12 miles) away, and winds over 100km/hr (60 miles/hr). We lost power for 17 hours and part of that time I was entertained by birds at our feeders, some of which we would not normally see. I’ve just finished processing them and will post a few more bird photos later this week. For this week’s photo challenge on the rule of thirds (and bokeh) I picked one of birds fighting at a niger seed feeder. More entries to the WordPress photo challenge are here. This entry was posted in Canada, Prince Edward Island, Weekly Photo Challenge and tagged birds, blizzard, PEI, Pine Siskin, Redpoll, snow, Vernon Bridge, winter. Oh well, this is just stunning. I have a couple of colleagues who do much better, but I’m very happy with these. Thanks. Thank you. More birds to come over the next week, but not necessarily following the rule of thirds. Thank you for feeding the birds. I hope you guys are all right. In Vancouver, we have no winter. I’d heard via Facebook friends that bulbs are blooming out there, and cherry trees are blossoming. Enjoy! Bulbs are in full bloom and some cherry trees are blossoming. We are enjoying the mild winter. Thank you. Really lovely picture of the birds. You bird posts have been fabu. PEI has been taking a whuppin’. I see the images in the news and just can’t imagine. Thanks for the positive feedback on the birds. Alas the geese have all gone (somewhere with un-snow-covered food) or been eaten by the bald eagles. The snow banks are so deep that when I went out in the (shovelled) yard with new snowshoes today I had a hard time finding a bank low enough so I could climb up and onto the snow. This too shall pass.